A child aged under 12 stay free when sharing a room with up to 2 adults - we do not charge any extra. Free breakfast up to five years old and get a discount on breakfast for child between the ages of 6 and 9 years. Special offers!! Baby crib (ages 0-2 years) can be requested for free. The offer is exclusive for direct booking only. Baby cribs are available upon request and availability. Blackout periods apply: 9-18 Apr & 3-5 November & 21 Dec-10 Jan.
Offer may not be combined with other promotions. 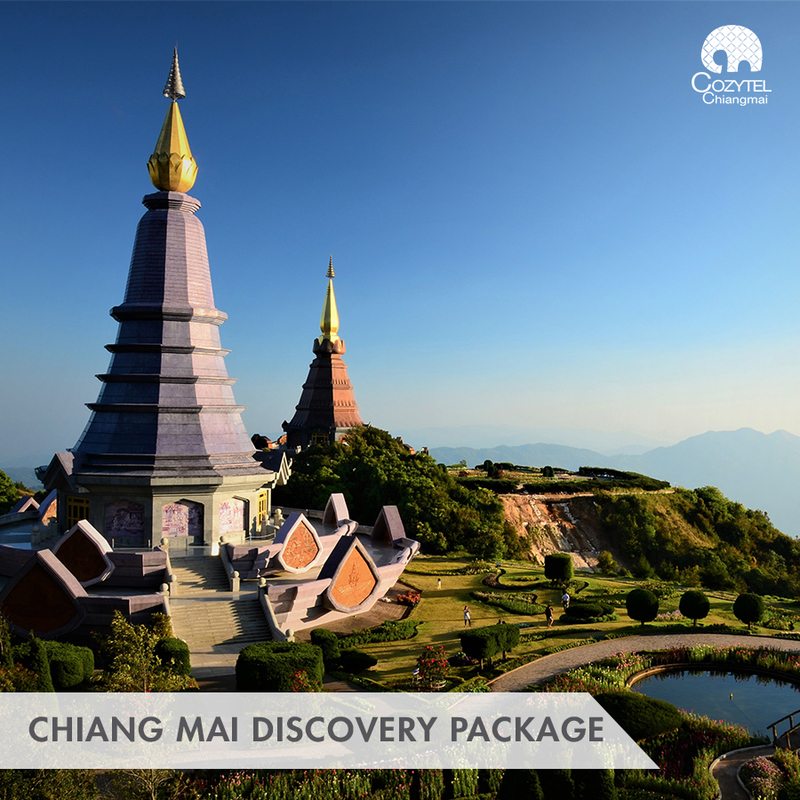 With our long stay promotion, you can make your wonderful experience in Chiang Mai last a little bit longer. If you stay with us for 7 consecutive nights or more, you will be able to choose one of our complimentary offers: one way transfer from our hotel to the airport or one day breakfast for 2 persons. 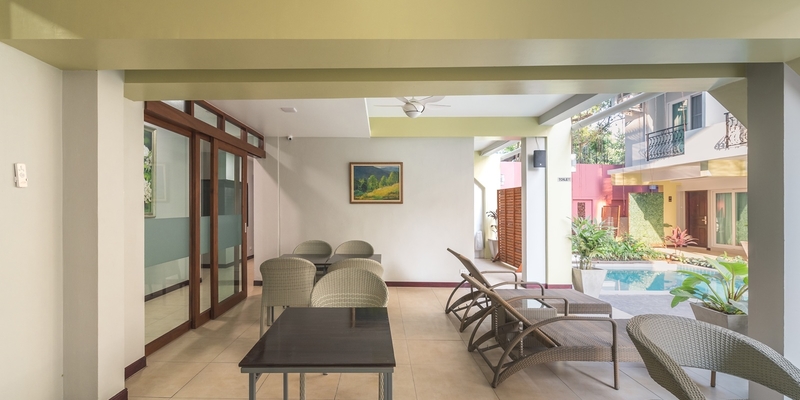 Minimum stay of 7 consecutive nights required. 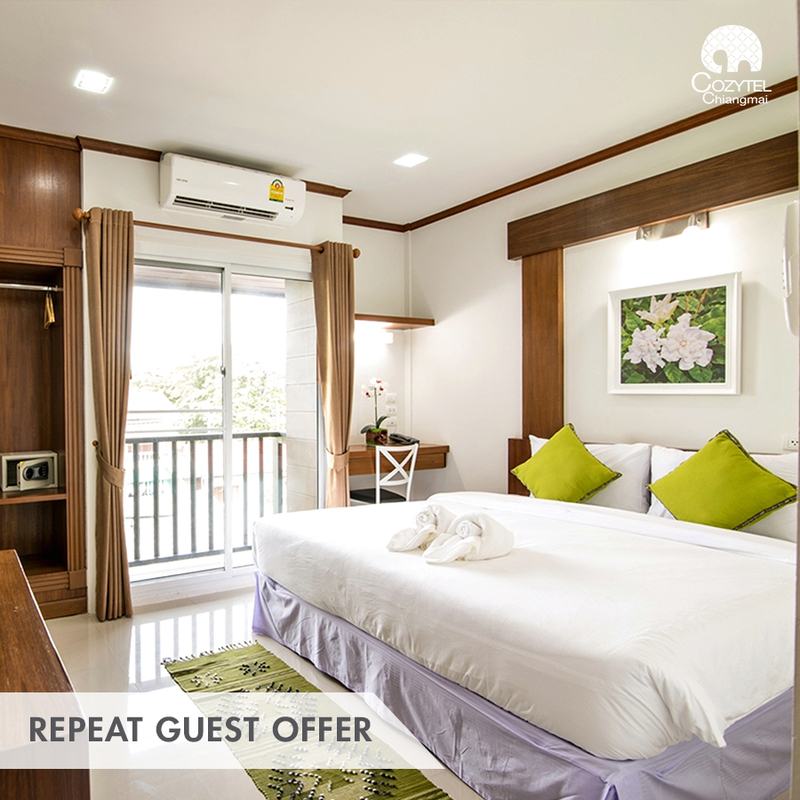 If you are a returning guest, just indicate the booking number of your last stay in the Special requests field of our booking form and get discount 10% top up to best promotion available with hotel direct booking. 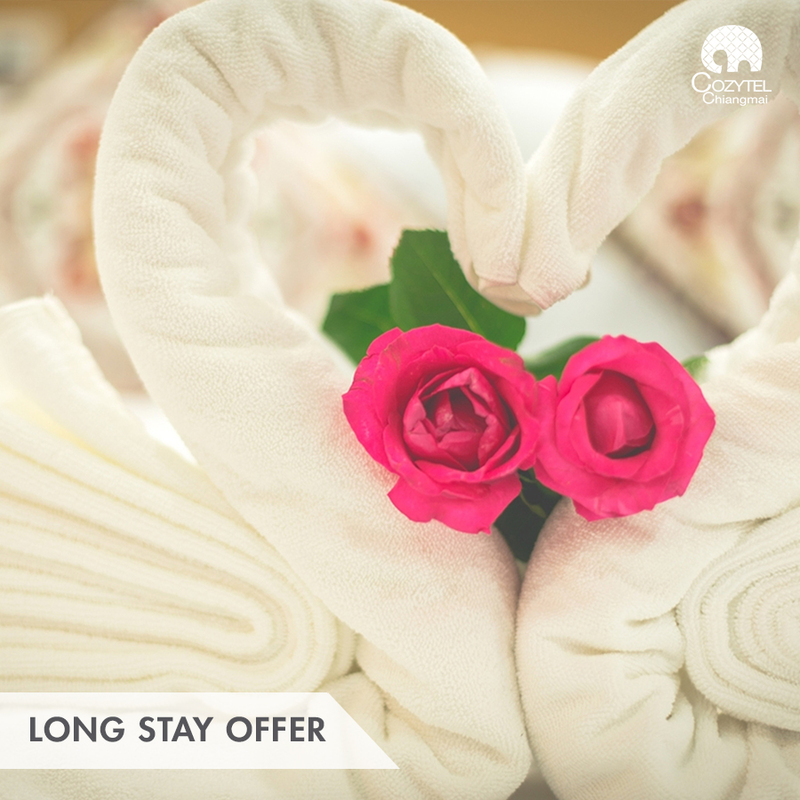 The offer is exclusive for pre-booked stay made directly with the hotel. Minimum stay of 3 consecutive nights required and the next arrival date must be at least 1 month after the previous stay period. To find out more about the tour programs, click here. The package is exclusive for advance booking via email or direct contact only. Valid for 2 guests per room, including daily breakfast, two days tours (join-in group type) with English or Mandarin tour guide (based upon request and availability). This package excludes entry fee of each option. 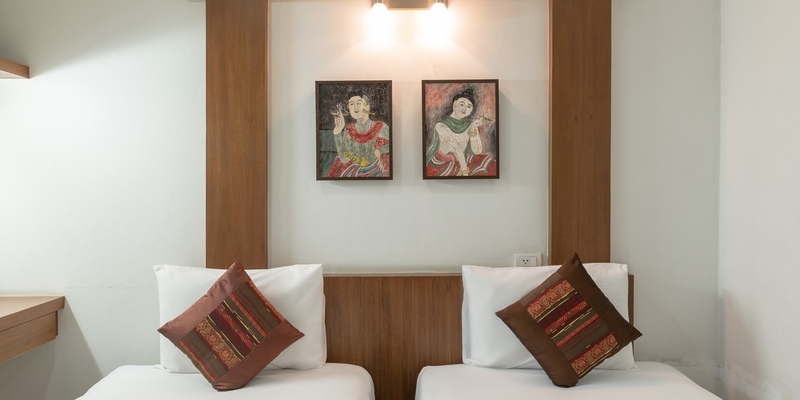 Minimum stay 2 nights consecutively. 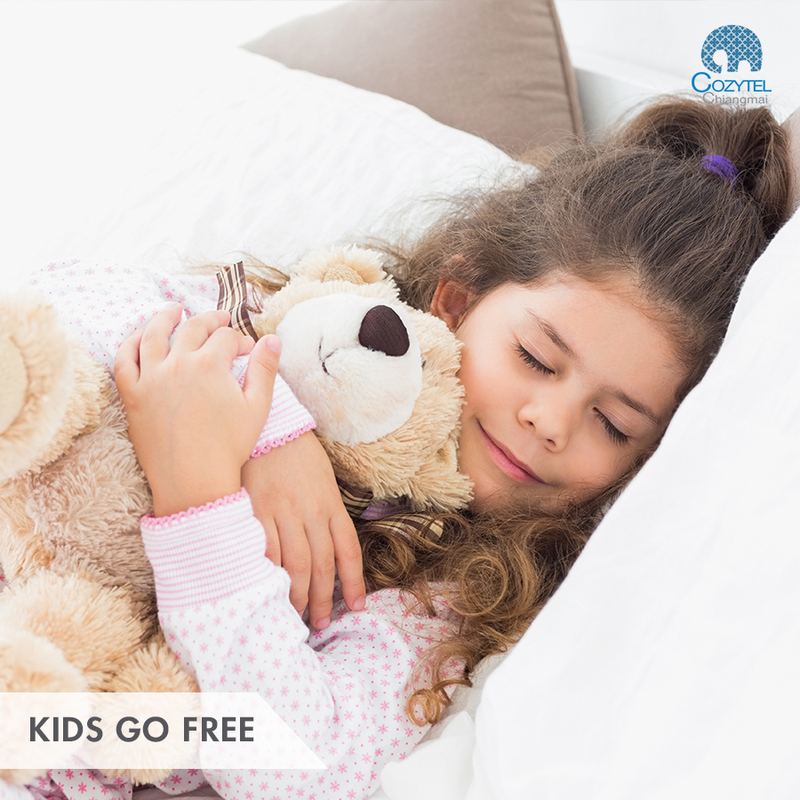 Payment for the voucher will be made directly at Cozytel upon the guest arrival only. Gift voucher will be given to you after payment. The voucher may be subjected to availability and non-refundable/non-changeable. Guests can purchase THB 2,000 gift voucher at THB 1,850 and THB 1,500 gift voucher at THB 1,390 to get the services available at Fah Lanna Spa. The voucher cannot be used in conjunction with other Fah Lanna Spa promotions. If the service value exceeds the gift voucher amount, the balance must be paid directly at the Fah Lanna Spa by Credit Card or cash. Treatments can be booked in advance. You will need to bring your voucher with you and redeem it at the reception of Fah Lanna Spa on the day of service.